Provide students with an enrichment opportunity that allows them to apply phonics skills at a deeper level. 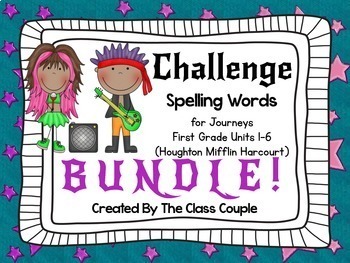 This bundle, which accompanies all 30 lessons from the Houghton Mifflin Harcourt Journeys Reading Series, creates a differentiated activity to advance the little spellers in your classroom. To decide which students will receive these words, I give a spelling pre-test to all of my students at the beginning of each lesson. (There is a spelling pre-test and a test page included at the end of this packet.) 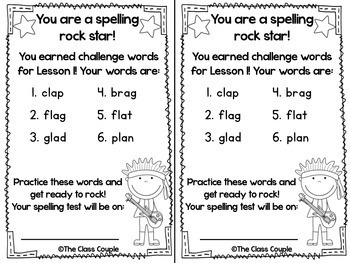 Students who get all of the spelling words correct receive the challenge words. 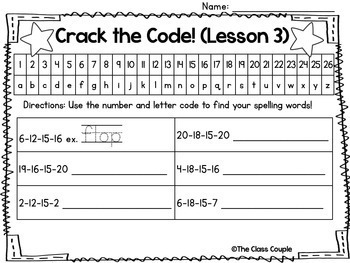 The challenge lists follow the same phonics patterns the students are learning in that lesson. 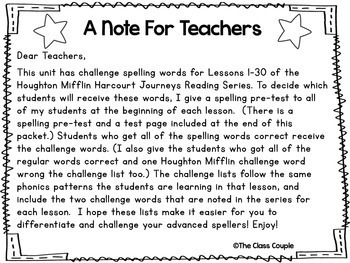 I hope these lists make it easier for you to differentiate and challenge your advanced spellers! This is a great way to provide differentiated spelling practice for your above level students! Note: This product is compatible with the Journeys 2017, 2014, and 2012 editions. If you would purchase the bundle and come across something that was different, please email me at theclasscouple@gmail.com, and I would be glad to update it for you. Journeys First Grade MEGA BUNDLE!